The ISO 3668:2009 standard specifies how to assess coloured materials in manufacturing industries (automotive, plastics, textiles, furniture etc.). in contrast, visual colour machting in the graphic arts industry is described in the standard ISO 3664:2009. 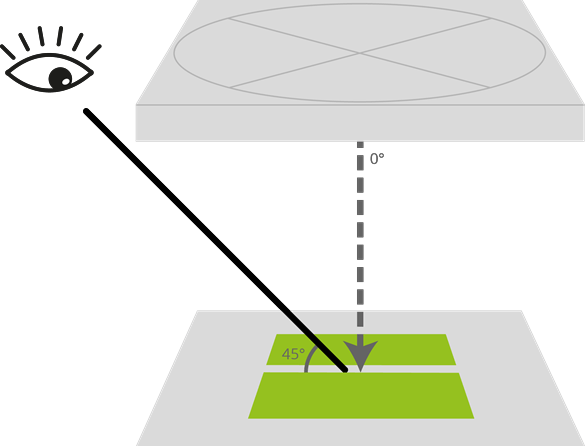 Reproducible conditions are necessary for standardised and repeatable colour matching processes. Natural dalight would be a good starting point for a light quality definition, but its light spectrum varies depending on time of day and location. Therefore, uniform viewing conditions require the use of colour matching areas using artifical daylight, CIE D65 being the most common in manufacturing industries. Note: For very bright substrates, the inner walls should be brighter. For very dark substrates the inner walls should be matte black in order to reduce contrast between the environment and the coloured sample. Corresponding interior walls are available on request. In order to standardise not only the viewing environment but also factor „human“, special requirement are placed on the observer. The observer must be perceive colour normally and should have experience in colour comparison as well as a good ability to distiguish different colours. Corresponding visual tests help to choose suitable observers. In addition, a neutral colour such as gray must be worn during the colour assessment. Colour differences are indicated to the ISO rating scale by hue, chroaticity and brightness. Finally, all details of the colour matching procedure should be recorded in an assessment report. 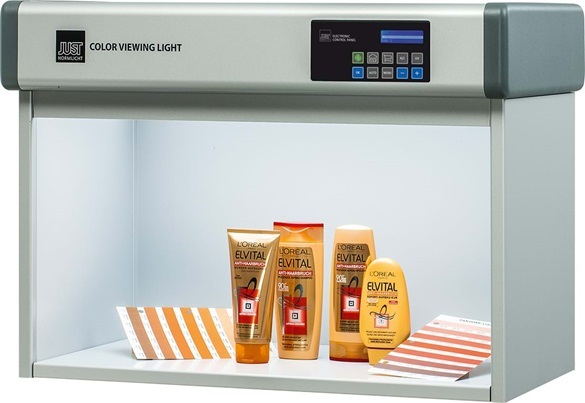 A corresponding function to create such reports is available with the PROFESSIONAL series of the Color Viewing Light booths. Metamerism occurs when two colour samples appear equal under one viewing illuminant, but look different with another light. Note the substrates must also be assessed by CIE-illuminant A (incandescent lighting). In the illustrated example, both bodies have different spectrum, that may appear different depending on the illumination type and light source. For standardised colour control it is necessary to choose D50 lighting for prints and D65 for industrial products, e.g. coatings, plastics, varnish etc. If detecting metamerism of the colours or substrates is required, additional illuminants/light sources are needed. With JUST colour viewing booths you can choose between different dimensions and numbers of illuminants but they should always include at least illuminant D65 and A for detection of metamerism. Comply with colour viewing / measuring geometry 0°/45° or vice versa. If necessary, use sample holders to provide the correct geometry. For very dark substrates a light box with matte-black interior lining can be used to reduce the contrast. Otherwise the colour viewing booths must be neutral gray (Munsell N7). The observer should be tested for normal colour vision and should have experience in visual color evaluations.